First Listen: 'Rave On Buddy Holly' Rave On Buddy Holly does more than just throw big names against the wall over the course of a generous 19 tracks. It also adds up to an impressively diverse collection of takes on the innocence of another era. Rave On Buddy Holly, a tribute to the rock 'n' roll pioneer, features Holly covers by Paul McCartney, The Black Keys, Patti Smith and many more. The album comes out June 28. The cover of Rave On Buddy Holly is wisely splashed with huge names, from Paul McCartney and Lou Reed to The Black Keys, Fiona Apple, Cee Lo Green and Modest Mouse. The collection's high-wattage guest list is pretty remarkable for a tribute album — a form usually defined by its unevenness and filler. 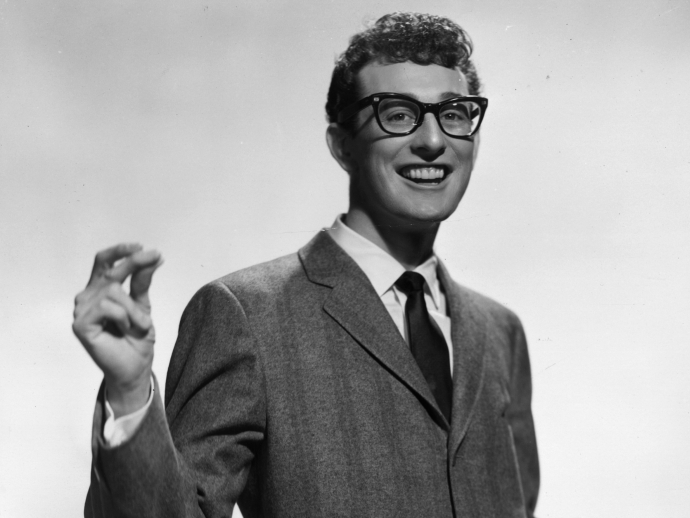 But Rave On Buddy Holly does more than just throw big names against the wall over the course of a generous 19 tracks. It also adds up to an impressively diverse collection of takes on the innocence of another era. Buddy Holly, who was only 22 when he died in a 1959 plane crash, churned out a formidable collection of pop classics in just a few years, and his catalog offers many unforgettable odes to wide-eyed, open-hearted youth. Here, the interpretations of those songs fan out in some unexpected directions: The Black Keys' "Dearest" opens the album on an uncharacteristically reserved note — the song barely registers at two minutes — while Paul McCartney spends more than twice as long howling like an unhinged teenager in "It's So Easy." My Morning Jacket is perfectly cast to bring out the gee-whiz in "True Love Ways," and Modest Mouse is similarly suited to find the menace in "That'll Be the Day," while Lou Reed uses "Peggy Sue" to achieve a kind of fusion of the two. If there's such a thing as "gee-whiz menace," Reed locates it. And, of course, many of these stars prove to be a nice fit for Holly's timeless words and tunes: Fiona Apple sheds her world-weariness for "Everyday," Cee Lo Green makes the most of the 93 seconds he gives "(You're So Square) Baby I Don't Care," and She & Him's Zooey Deschanel has spent much of her singing career marinating in the gentle naivete she exudes throughout "Oh Boy!" Together, alongside the venerated likes of Patti Smith and Nick Lowe, they give this collection the sweetness its source material demands, without losing sight of the melancholy that lies beneath.